​To show the love, support and appreciation of a grateful nation, by providing necessities and comfort items to those serving our country, all over the world, through the continued support and generosity of businesses, individuals and volunteers. ​Holiday 4 Heroes is a grassroots effort started in 2007 by a local business owner, Jonette Kessack. owner of Sip and Send. Jonette became aware there was a need to fill, to provide cheer and comfort to our active duty military members in war torn countries. This year 1300 boxes of supplies were sent to our heroic men and women serving to protect our freedom. Every cent and product collected goes directly to providing these packages to our service members. ​ Since 2007, we have sent over 7800 comfort and care packages to our active duty personnel. ​Year-round we now send 40 - 50 comfort boxes each month to our brave men and women who are serving all over the world. For our holiday effort, starting in September, we search out local soldiers to adopt. We try to supply their entire camp. Their packages are mailed out the last week of November and are received by our soldiers for a little Christmas appreciation and cheer. Our community has really come together on this project. 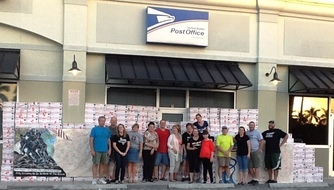 People donate tons of supplies, make their own care packages and donate money for the mailings. Please join us in the effort to support these very brave men and women who protect us. Remember, freedom is not free! As the mission evolves, Holiday 4 Heroes, supports our military families at home by giving them a Christmas filled with joy and less worries. This year, we provided a Merrier Christmas for a local Cape Coral family, who were going through some difficult times. A family, who has sacrificed so much for us, were given everything they needed for the holiday. Our hope, with your help, is to continue to do this each year when there is a need. If you know of any service member that can use our services please contact us. ​We asked for help with donations for Tyndall and the surrounding community. Taking donations of new, unwrapped toys for children of all ages, bikes, trikes, sporting equipment, gift cards and anything that would put a smile on all their faces. We loaded two trailers and pick up trucks and drove to the Panhandle to deliver your donations. We collected over 4000 toys and stocking stuffer's and over $2000 of gift cards and monetary donations.
" We so appreciate everything that Holidays for Heroes did for our area. It was such a blessing and we could not have done it without all of the help we had this year. We are so appreciative! We would see joy and relief on the faces of many of the parents who came to “shop” for their children, and we certainly had a festive air of gratitude every day. Our volunteer shoppers had just as much fun as they helped the parents pick out gifts. It was an experience that many of our volunteers will never forget. We were also able to have a gift wrap station that was staffed with volunteers, and had Christmas music playing while parents waited in line to have their presents wrapped. It was certainly a festive environment! "